This four-song EP will be released on July 13. The band has already released three of the songs – “Bridges Burn”, “Darling” and “Bullets”. This album will be released on July 13. The film will be available on that date in select cities. I’m looking forward to this release as I saw a concert on this tour that this album was recorded on. From the artist’s website: “In his all new Noble Ape stand up special, Jim Gaffigan gets personal as he discusses the medical crisis that befell his wife and family this year, which almost led to his retirement”. This album will be released August 31. It is Lee’s follow-up to 2016’s Spirit. Categories: Music & Concert Reviews and News | Tags: Amos Lee, For KING & Country, Jim Gaffigan, John Fogerty, Lauren Daigle, music, music albums, Music News, NEEDTOBREATHE, Paul McCartney, Paul Simon, upcoming albums | Permalink. Andy Mineo returns with his first new album (mixtape) since 2015’s excellent Uncomfortable. The album debuted at #2 on iTunes Albums chart and #1 on their Hip-Hop/Rap chart. On this release, he teams up with good friend Wordsplayed (as Magic and Bird), the son of Nigerian immigrants who came to the United States in the early 1980’s and met Mineo in 2008. This playful and basketball themed release is a perfect summer listen, and builds on their 2015 single “Lay Up”, which is included here as a bonus track. Along with BEAM, the release includes production from GAWVI and !llmind, who also produced Uncomfortable. Hi-Five – A short introductory track, mostly speaking. KIDZ – The song was produced by Tyshane and Daniel Jordan. It was written by Tyshane, Jordan, Wordsplayed and Mineo. This was the first release from the new album. The bridge contains a brief piece reminiscent of the Doxology. Dunk Contest – This song was produced by Young Sidechain and Beam, and was written by Wordsplayed and Mineo. It was the second single to be released from the album. The two trade lines about basketball, cities, single moms, etc. 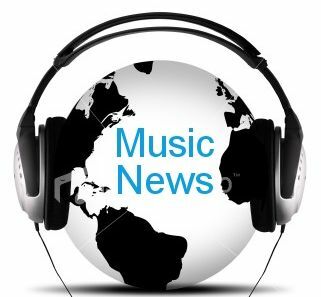 Categories: Music & Concert Reviews and News | Tags: Andy Mineo, Christ and culture, Christianity and Culture, Coram Deo, Magic & Bird, Music News, music quotes, music reviews, NEEDTOBREATHE, Walking on Water, Wordsplayed | Permalink. Switchfoot is one of my favorite bands, second only to U2. This is their first full-length album since their chart-topping 2014 album Fading West. An EP of songs from the Fading West sessions The Edge of the Earth, was also released in 2014. Lead singer/songwriter Jon Foreman also released four solo Wonderlands EPs in 2015. This is the band’s 10th album in their 20-year career. It is also the first time in ten years that the band has worked with producer John Fields, who worked with them on their 2003 breakthrough album The Beautiful Letdown, as well as 2005’s Nothing is Sound and 2006’s Oh! Gravity. Bassist Tim Foreman has said that the band went through a dark season and the record become a source of light in the middle of that dark season. He stated that the album rose organically out of the ashes of adversity. This is an excellent new release from the band that always sounds fresh. Jon Foreman’s vocals are excellent and Chad Butler’s drums really stand out. I would have liked a few more rockers, but still love the album. Holy Water – a strong opener with grungy drums and guitars that reminded me of the band’s raw Oh! Gravity sound. Jon sings that he has fought the fire with fire and he wants to taste the Lord’s love again. Float – features an infectious funky beat. I liked this song instantly. Jon sings “Turn it up so I can feel it. Loud enough so I can get near it.” He sings don’t let them tell you what to feel like, and that money’s going to leave you broken-hearted. It can’t finish what we started. A favorite. Where the Light Shines Through – opens with guitar, then quickly goes into drums and the full band. Jon sings encouragingly that we can’t run away from ourselves. He sings that our scars shine like dark stars and that our wounds are where the light shines through, it’s where the light finds us. The band describes it as “a gospel song – an open palms altar call – bring your scars and abuse and bruises with you”. I Won’t Let You Go – opens with acoustic guitar. Jon offers a vulnerable Bono-like vocal as the song builds. This song works on different levels, including being a song in which the Lord is speaking to us about trusting Him. Another line that was powerful was “pain gives birth to the promise ahead”. Categories: Music & Concert Reviews and News | Tags: Amos Lee, Christ and culture, Christianity and Culture, Coram Deo, H A R D L O V E, Music News, music quotes, music reviews, NEEDTOBREATHE, Spirit, Switchfoot, Where the Light Shines Through | Permalink. On a hot Sunday evening in downtown St. Louis, comedian Jim Gaffigan played two shows on his Contagious tour at the beautifully renovated Peabody Opera House, which is located next to the Scottrade Center (located on the site of the old Kiel Auditorium, which was part of the facility that included the Opera House, which opened in 1934), and near the historic Union Station. We attended the second show at 8:00 pm, which was played to a packed house of all ages in the 3,500 seat venue. Opener Ted Alexandro opened with a 15 minute funny set and Gaffigan performed for about 65 minutes. 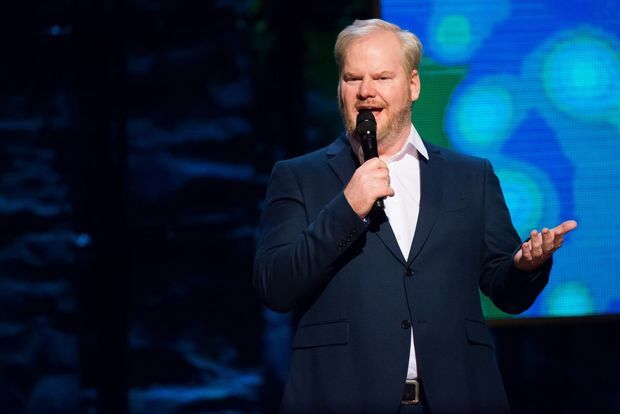 Known for jokes about himself and his five kids, his being fat and his love of food, Gaffigan gave us all of that and more in a performance of mostly all new material. I sat in my seat with a big smile on my face the entire evening. Guys with pick-up trucks who never seem to be picking up anything. He’s not a man’s man because he doesn’t know anything about cars or how to fix anything. His hometown in Indiana in the winter resembles Siberia. How he uses a belt to make himself look less fat, kinda like Santa. “Fatting out” of clothes and keeping all of them in your closet. Speaking in English, like Jesus did. Jesus’ miraculous multiplying of the bread, though at times he created unpopular flavors like pumpernickel. And some new jokes about Hot Pockets. Gaffigan is sometimes referred to as the “clean comedian”. He is funny without resorting to adult language, a rarity today. Check out his new television show on the TV Land network, The Jim Gaffigan Show. 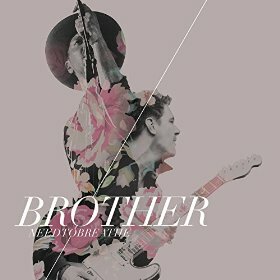 This week’s song of the week is from one of my favorite bands NEEDTOBREATHE. “Brother” was originally included on their excellent 2014 album Rivers in the Wasteland. This version features guest Gavin Degraw. Sweet Victory. Trip Lee has released a new video for his song “Sweet Victory” from his Rise album. This is Not a Test. Toby Mac performed the title song from his forthcoming (August 7) album at Alive 2015. Angel of Harlem. Jimmy Fallon and the Roots Join U2 on stage at Madison Square Garden on July 22. Shed a Little Light. On July 29 at his Columbia, South Carolina concert, James Taylor was joined onstage by the Charleston choir Lowcountry Voices. Together, they sang “Shed a Little Light” in memory of the victims of the Charleston shooting and their families. The entire audience stood in support. Watch this moving video. Lip-Sync Battle. Did you see Tom Cruise and Jimmy Fallon in this epic lip sync battle recently on The Tonight Show? Categories: Music & Concert Reviews and News | Tags: Brother, Christ and culture, Christianity and Culture, Coram Deo, Jim Gaffigan, Music News, music quotes, music reviews, NEEDTOBREATHE | Permalink.